During menopause, 75% of American women experience hot flashes. This is because as a woman's body changes, her estrogen levels - which have been more or less balanced her whole life - suddenly drop. Lowered estrogen levels affect the hypothalamus in the brain, which is responsible for regulating body temperature. The result is sporadic and unpredictable oscillations in heat through the body that can make you hot, sweaty, dizzy, and panicky. This is very distressing to many women who can get hot flashes daily, but there are many safe and effective treatments that can reduce them. During menopause, estrogen levels decline. This directly affects the hypothalamus in the brain, which can in turn result in extreme body heat unexpectedly. Therefore, it is important to restore lost estrogen and balance hormone levels. Black cohosh has been long used by Native Americans for gynecological purposes, and is considered one of the best of all herbal remedies for hot flashes because of its phytoestrogen content. Recent studies show that this herb can relieve hot flashes and night sweats. Anxiety is one of the most impactful triggers for hot flashes. When someone is stressed out, similar cues as for hot flashes are sent through their body. For this reason, increased heartbeat, redness, sweating, and heightened temperature can be doubled. Maintaining calm and knowing how to cope with an episode is of central importance. 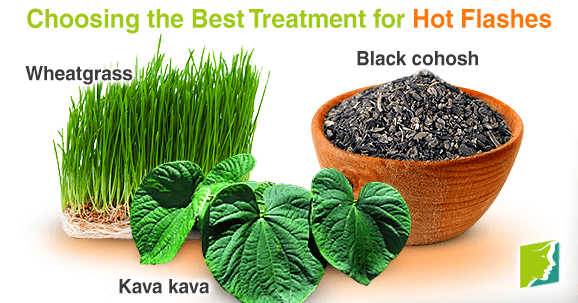 Kava kava is an herb that has been used ritualistically by Pacific Islanders to achieve relaxation of the body and mind for centuries. If stress is abundant in your life, this is a possible herb for overcoming hot flashes. Valerian and lemon balm are also relaxing and calming herbal supplements. Wheatgrass is extremely nutritive - full of vitamins, minerals, and amino acids. It also contains superoxide dismutase, which boosts one's antioxidant defense system. This herbal supplement has been traditionally used to reduce sweating. It is also gaining popularity as an alternative to coffee since it does not contain caffeine, a compound that can trigger hot flashes. Always remember that you are in control when a hot flash arrives. It may seem hopeless at first, but with herbs and nutrients, you are fully armed for relief from body heat, sweating, and panic. For this reason, many women are seeking alternative remedies for hot flashes. A hysterectomy removes the uterus, but can also include the removal of the ovaries.This induces menopause and therefore symptoms of menopause. Hot flashes are one of the most common symptoms of menopause. Click here to learn more about them and spicy foods.